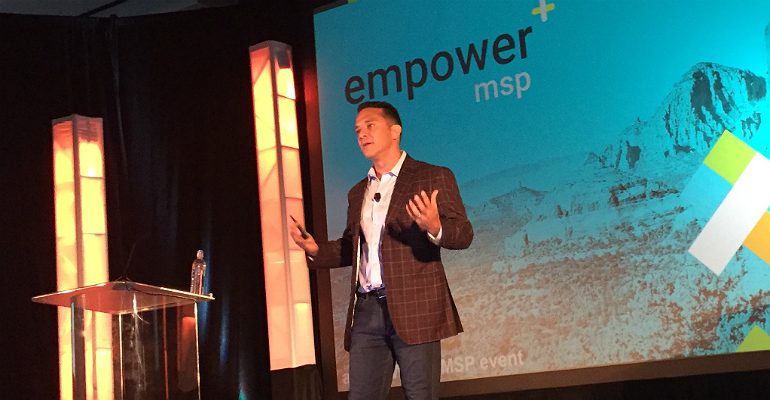 At its Empower MSP conference, SolarWinds MSP rolled out its new service program that builds on its Threat Monitor product, adding outsourced around-the-clock SOC services to the portfolio. SOLARWINDS MSP EMPOWER MSP — Cybersecurity is an increasing need and concern for MSPs and their SMB customers, so SolarWinds MSP is investing more to provide a broader portfolio of cybersecurity services. That message was conveyed to partners during the first day of SolarWinds MSP’s Empower MSP conference in Scottsdale, Arizona. The vendor has 22,000 partners and customers, and serves 450,000 organizations globally. Global IT services spending will reach $1 trillion this year, growing almost 8 percent in U.S. dollars, he said. No one is spending more to keep MSPs and their SMB customers safe, he said. At the conference, SolarWinds MSP announced the launch of the SolarWinds Threat Monitoring Service Program. The new offering builds on SolarWinds Threat Monitor with outsourced security operations center (SOC) services delivered via SolarWinds Threat Monitoring service providers. The company gained Threat Monitor through its acquisition of Trusted Metrics this summer. The Threat Monitor platform includes automated threat detection, active response to security incidents and audit-ready reports. The SolarWinds Threat Monitoring Service Program is aimed at supporting MSPs who have purchased Threat Monitor, but prefer to partner with one of the SolarWinds Threat Monitoring Service Providers (TMSPs) to deliver tandem managed security services to their customers. Falanx Group and Secuvant are the Threat Monitor program’s inaugural TMSPs. Falanx, based in London, brings more than 20 years of experience in security and SOC services to the program, serving a wide range of vertical sectors with a portfolio of security services. Secuvant is focused on providing business-driven cybersecurity solutions to SMBs.